As noted two days ago in this blog, the contrast between the outcomes of the same-size earthquakes in NZ and Haiti is stark. Here is a discussion of one of the reasons for the difference. Building code saves NZ from serious destruction; Radio Australia, Sept. 6. As we’ve heard in earlier reports, many New Zealanders are assessing the damage from the weekend’s earthquake. Jeff Crosier, is a structural and earthquake engineer from consulting firm Miyamoto International. While the New Zealand earthquake was larger than the one which devastated Haiti earlier this year, killing 200 thousand people, Mr Crosier says it is surprising how little damage has been caused in Christchurch. One more explanation: Why the N.Z. quake is no Haiti. MSNBC, Sept. 6. New Zealand sits above an area where two tectonic plates collide. The country records more than 14,000 earthquakes a year — but only about 150 are felt by residents. Fewer than 10 a year do any damage. 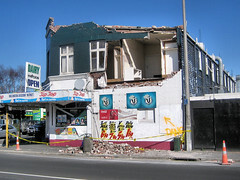 New Zealand’s last major earthquake registered magnitude 7.8 and hit South Island’s Fiordland region on July 16, 2009, moving the southern tip of the country 12 inches (30 centimeters) closer to Australia. Regarding the financial aspects of the recovery, the existence of insurance funds for residential reconstruction is an unusual feature. Nevertheless, the national government will have to assist public entities as is true in the U.S. system. See UPDATE: New Zealand Building Shares Rally After Quake; Bonds Weaken; Wall St. Journal, Sept. 7. This entry was posted in Earthquake, Haiti, Human Impacts, International Disasters, Natural Disaster, New Zealand and tagged Building code, Christchurch, Earth Sciences, earthquake, Haiti, Natural Disasters and Hazards, New Zealand, Radio Australia by recoverydiva. Bookmark the permalink.